SAIL AREA: 388 sq. ft. 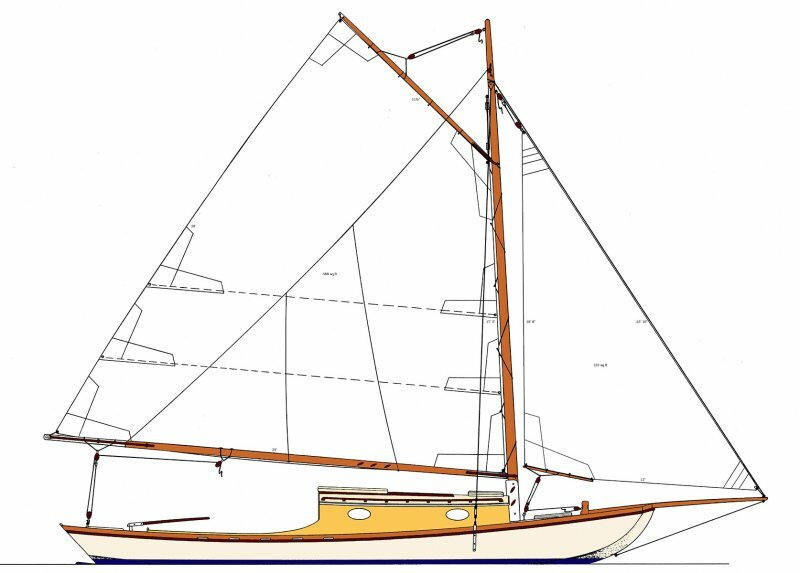 TYPE: Maxi-Trailerable Gaff-rigged New Jersey “Chicken-Breasted” Vee-bottom Garvey Sloop—Pocket Cruiser. This is a very simple boat to build. She is intended for semi-protected water, but can make coastwise trips in settled weather. 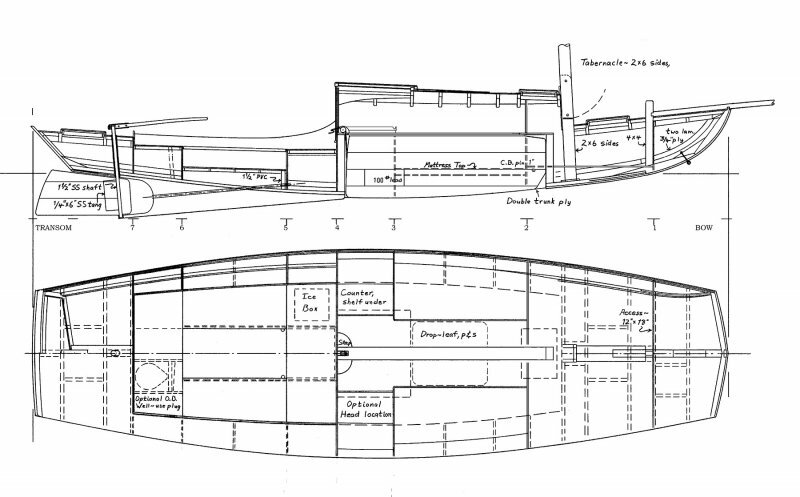 Scows are not slow boats—this hull is a large version of the very competitive racing scows, and will give a surprising turn of speed. The cockpit is self-draining; an outboard can be used in an offset-well, or a small inboard may be installed under the bridge deck. The mast is tabernacled to simplify set-up and break-down. Headroom is 4′ 6″. CONSTRUCTION: Cold-molded plywood/epoxy over longitudinals and 5/8″ plywood bulkheads. Chine logs from 2x4’s, sheer clamps from 1x4’s, sawn beams. 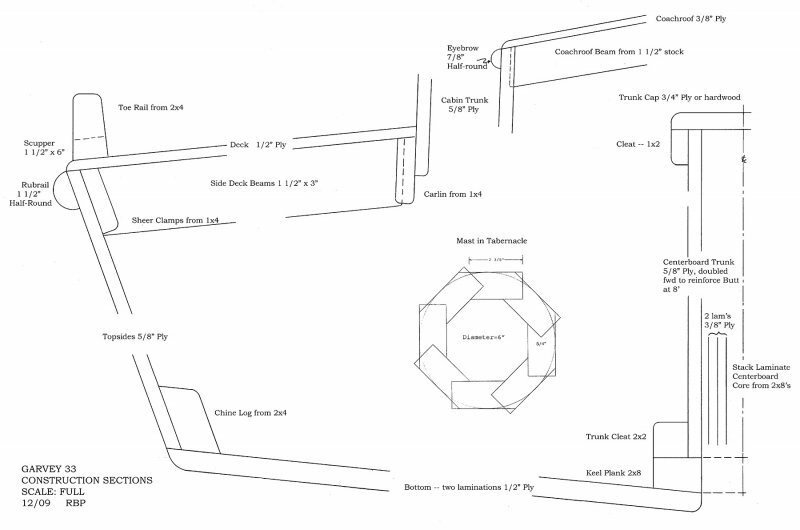 Bottom planking: two laminations of ½″; sides: 5/8″; decks ½″—all using full sheets of marine plywood when possible. Covering system: epoxy-saturated 4 oz Xynole-polyester cloth (two layers on bottom; one elsewhere); including interior wet areas. 2' 3 1/2" / 5' 3 1/2"